By default WordPress will add every page you add to it’s menu and while this is ok to start with it can soon become cluttered. 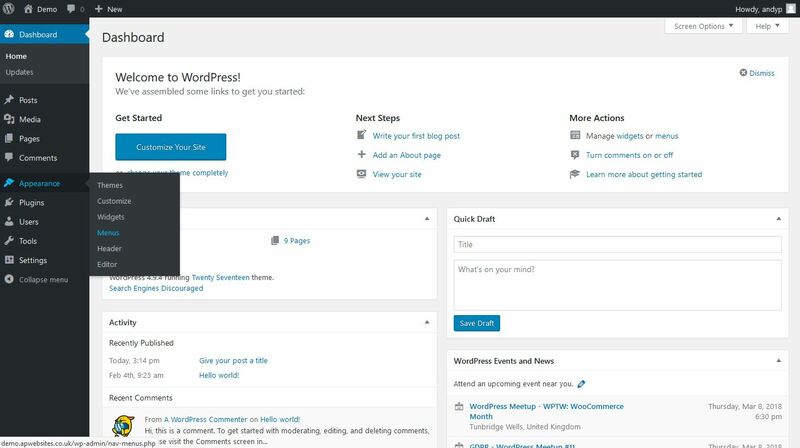 In this post we’ll look at how to take control of your WordPress menus. 1. From the dashboard select “Appearance” and then “Menus”. 2. To create a new menu click the “Create new menu” link near the top of the page, if you have already created a menu skip to step 5. 4. Assign the menu a location by clicking the “Manage Locations” tab, selecting a position for your menu, and then clicking the [Save Changes] button. The actual positions may vary depending on your chosen them. 5. Check the boxes next to the pages you want to add and click [Add to Menu]. 6. You can reorder menu items by dragging the boxes then click the [Save Menu] button. 7. To create a drop down menus by indenting child items slightly to the right of the parent item.